I love the shape and symbolism of the hare, whether ir is running, sitting or gazing. I also enjoy watching birds, especially wading birds along the coastline. Welcome to Jeanette’s enamels. Feel free to browse and if you see something you like, contact Jeanette to check availability. 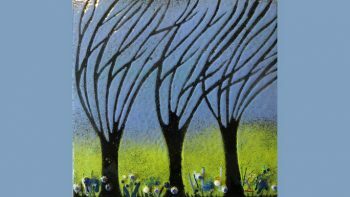 Jeanette is a self taught enamel artist who has worked with glass in other ways in the past (fusing, etching, leaded glass, stained glass). She arrived upon enamelling as a way of combining her love of glass with her artistic ability. Enamelling is the art of fusing glass on to metal. Jeanette uses the dry sifting method of enamelling which means the glass powder is applied dry and designs are created by sifting various colours of glass powder on to the cleaned copper to create the design. Once the design has been created it is put into a kiln at a temperature of approximately 800°C for a few minutes. More enamel powders can be applied for further firings until the desired results have been achieved. Jeanette also uses glass frit, glass beads, glass rods and millefeuile to enhance her pictures. These are always put on for the first firing. 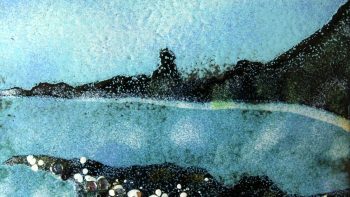 Jeanette loves the lustrous and vibrant colours that can be achieved from enamelling. The final result can sometimes be unpredictable so it is always exciting to see the final picture once the piece has been fired and cooled. Although Jeanette may use the same stencils for repeat pictures, all of the pictures are original and no two pictures are exactly the same because Jeanette likes to make each picture special and a one off in its own right. Jeanette has lived in some spectacular areas of Britain over the past thirty years – North Devon and the Forest of Dean in Gloucestershire. She is inspired by her surroundings and the natural world. Jeanette creates hand cut stencils from local scenes, trees and plants that have inspired her. 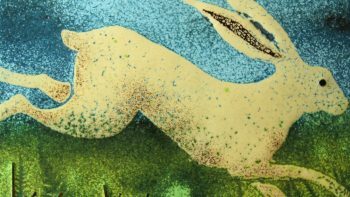 She also uses interesting leaves, especially ferns, seed heads and any foliage that once pressed would make ideal stencils for the dry sifting process of enamelling.